For a while now I’ve wanted to build a search engine that would index TV shows by the shows’ closed-captioning transcript. Now I don’t have to, because the Internet Archive (www.archive.org) has built it for me! 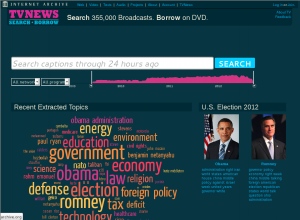 The Internet Archives TV News Search & Borrow is amazing! It’s a catalog of news video which is searchable by keyword. Now anyone can do the video research that the wizards to on shows like The Daily Show do, right from their own desks. Obama made a speech about indefinite detention? Find it in seconds. Want to see Romney mixing up Randy Owens of Alabama with Lynard Skynard? A few clicks and it’s in front of you. Give it a try and see for yourselves. It’s addicting. 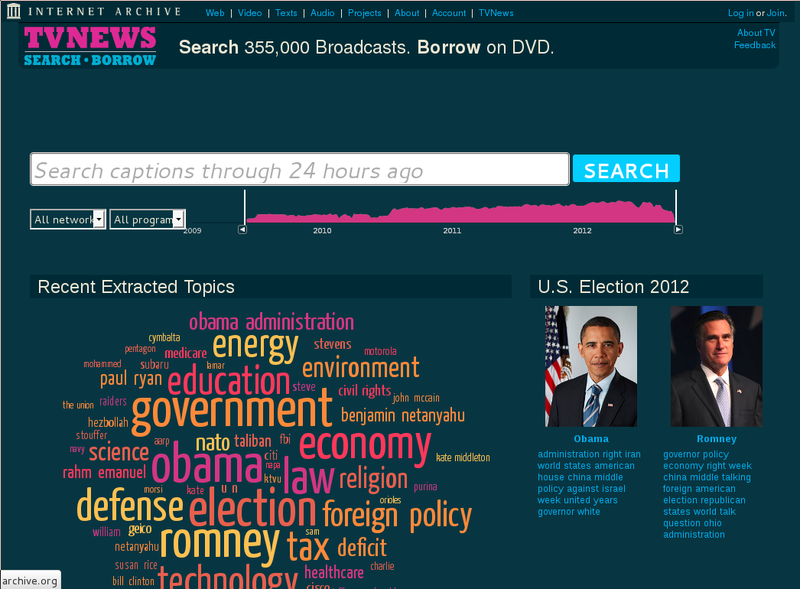 via Launch of TV News Search & Borrow with 350,000 Broadcasts | Internet Archive Blogs. A week ago, I decided to dust off our Roku player. It had been spending most of its time umplugged because it competed for the only S-Video jack on our bedroom’s old TV. The Roku can kick out a 720p HD picture, though, and our HDTV has a ton of unused inputs so I ordered a new HDMI cable and hooked it up once it arrived. The Roku looks beautiful on the HDTV. Yesterday, Netflix announced the company is hiking its prices by up to 60%. While I’m disappointed by Netflix’s move (and think BitTorrent traffic will undoubtedly rise as a result), having the Roku available means I have plenty other choices for Internet TV. Not only does the Roku play Netflix’s streaming, it carries dozens and dozens of other channels, both video and music. I’ll continue to tinker with the Roku. I’ve been pretty impressed with what it can do. I saw an ad on Craigslist a few weeks ago for some Free to Air satellite receivers that were being sold. The price was right and I’ve long been interested in seeing what I could pick up freely and legally from the skies, so I bought the receivers and later went back for some bigger dishes. I had the day off Friday, so I set it all up, tuning in Galaxy 19 at 97°W, which is a satellite that carries a few hundred mostly-international channels. After some brief fiddling with the aim of the dish I was watching Al Jazeera straight from space. It was actually the moment I first heard that Hosni Mubarak had resigned. This is really cool stuff, though there isn’t much in English worth viewing on this particular satellite. I plan to set up other dishes to pull in other, more interesting satellites, but for now I’ve proven that it works. In time I should be enjoying all types of radio and television beamed freely from space. Now that I’ve played around with the Roku for a few weeks I decided to check out the Amazon Video on Demand (or VOD) store. Amazon offers fairly new movies for “rental” or “purchase,” and through the magic of Roku these rentals get automatically billed to your Amazon account. They have content for standard-definition as well as high-definition. I checked out a few of their free offerings (an HD promo for The Office) and was impressed by the quality. I was doing some Internet searches to come up to speed on some satellite TV technology when I came upon this amusing Chinglish description for an amazing set-top box. It combines many of my interests: amusing, over-the-top Chinglish; Linux; and DVB-S satellite set-top boxes. Our geek-owned beach house includes a Roku Digital Video Player. Formerly known as the Roku Netflix Player, this player has branched out beyond Netflix. It now has dozens of video and podcast streams that can be delivered straight to your television. I admit I had my doubts about this modest little box, but after seeing it in action I’m convinced. We already enjoy Netflix’s “Watch Instantly” video streaming through the built-in capability of our Samsung Blu-Ray player. 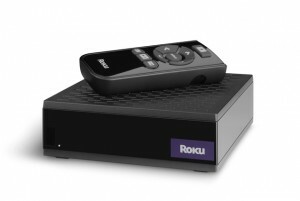 To my surprise, the Roku blows our Samsung away. The Roku user interface is far better than our Samsung player’s. I’ve been resigned lately to having my Myth Frontend not keep pace on playing back HDTV content. My theory has been that the laptop PC I’ve set up for this task is just not peppy enough. Well, today the kids were watching the latest NOVA episode and I noticed that the every-two-second blip seemed to sometimes stop for 10 or more seconds at a time. The content, however, seemed to be just as intense as before. This seemed to tell me that the frontend hardware is capable of keeping up with the HD stream but something else is keeping it from doing so. I’ll have to investigate all the little performance tweaks for the frontend to see what might be the magic step. For Christmas, my parents gave us a gift card to apply towards a Blu-ray player that could stream Netflix. I did some research on models this morning and picked out what I wanted: the Samsung BD-P1600. I don’t own any Blu-ray discs and may not ever. All I wanted was a player that would excel at streaming Netflix movies. If it could play discs too, well, so much the better. I spent the evening playing around with it. How does it perform? Fantastically. On the first power-up, it took several minutes for the system to download an apply a firmware update. After that, though, it’s worked very well. I was stunned at the picture quality when I tried streaming some movies: it’s amazingly good. So much so that I’m not at all surprised now that the big cable companies are shitting bricks over this technology. The writing is on the wall for cable TV: I have 12,000+ titles of movies and television shows available for watching anytime. Why would I want to saddle myself with a costly cable subscription? For the past few weeks I’ve been puzzled by the significant load shown on my MythTV backend generated by the kdvb-fe-0 process. The server was running at 50% load or higher even when there was nothing being recorded. I poked around and found that the kdvb-fe-0 process is created by the Linux DVB drivers, which is the driver used for my TV capture card. Because this driver is running so close to the kernel I am not quite sure how to troubleshoot it. The software tools I would normally use may not work at this level. I actually had some free time last night so I decided to catch up on the TV shows I’ve been recording but haven’t watched. One of them was the PBS show French in Action, which teaches French at the college level. It’s an immersion-type series first show in 1987 which teaches the language through various scenarios. The three years of French I took in high school are as old as the TV show itself and yet I found that following the conversations was much easier than I expected! I found the show’s way of dumping you into the dialogue and only afterward tying up the loose ends – after you’re forced to try to figure it out yourself – to be very effective in making the lessons stick. In fact, it seemed easier to pick things up using video than it did using textbooks and a French-speaking teacher in the classroom. Of course, it didn’t hurt that I could rewind the show if there was dialogue I didn’t understand. Looks like I’ll now be brushing up on my French in the evenings. If that goes well, I may also start watching all the episodes of Destinos: An Introduction to Spanish that I’ve also been recording! (P.S. All the episodes of French in Action can be streamed online for free as can episodes of Destinos).